The Forensic techniques applied in the television program CSI can sometimes have strange consequences. Recently in an episode I watched the CSI team was analyzing blood splatters found on a wall. One cast member read two numbers to another who had a computer and the second member of the cast with a computer said, “Let’s see… that’s the arctangent of thirty degrees.” and ultimately the the CSI team figures out where the victim was standing from the angle of the blood splatter on a vertical wall. Wow I thought… how did they do that? That episode started me on a computer research project on forensic blood splatter analysis and the result of those endeavors resulted in this article and others on ricocheting bullets. I marvel at how my mind related these seeming two unrelated subjects. Forensic blood splatter analysis is quite a science unto itself. As my study continued, I became intrigued with similarity involved with a round blood droplet splattering a vertical wall and a bullet ricocheting from the surface of the ground. Maybe the same math works in both places. Blood hits the wall at an angle and sometimes bounces off in droplets and bullets hit the ground and bounce or ricochet or “skip” beyond the initial impact point. I also remembered that artillerists also used to ricocheting solid shot into advancing troops with great effect. On reading more, I came across a picture from a World War II government publication on naval ricochets against ship armor. The following picture reminded of something I had seen in relic bullets. against the plate severely deforms the nose of the shell (windshield) away from the plate. 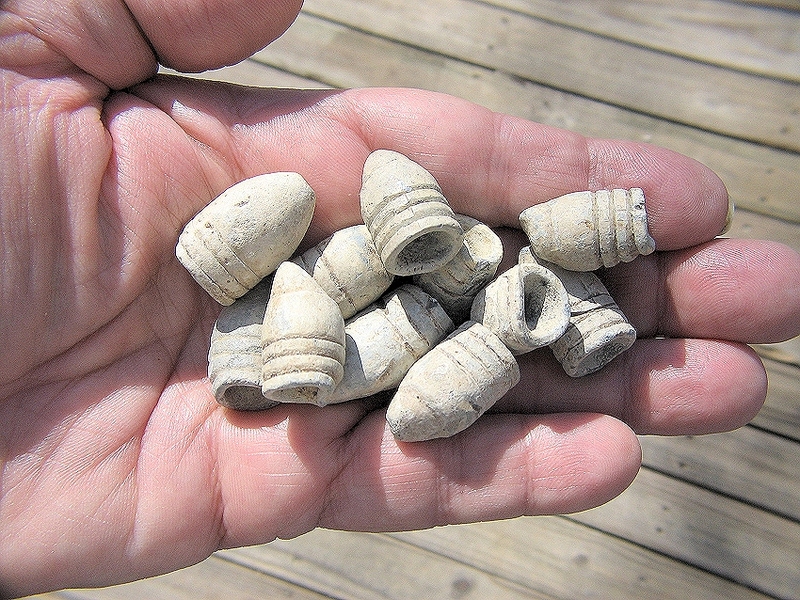 Bullets found near Civil War campsite can be found with similar deformation patterns. I have found what I refer to as "low impact" bullets with this shape in discharge areas and practice areas near Civil War campsites. Discharge areas were areas where soldiers were ordered to discharge their weapons for safety reasons before entering the town or their campsite. Practice areas were areas near campsites where green soldiers improved their marksmanship skills. High impact deformation bullets probably hit the ground or target at a high angle of impact and low impact probably hit the ground near the target at a low angle. Low and high impact bullets are found in rifle practice and discharge areas near Civil War campsites. Low impact bullets have ricocheted based upon their shape. The relic field patterns of bullets in each of these places is distinctive and written about in my latest book, Exploring Civil War Campsites. Funny thing about shot bullet end profiles. They tell us a lot about the type of weapon that fired the bullet and sometimes who fired it. In my book, I discuss the end profiles of shot bullets. Ordinarily, the end profile shape is formed as the bullet skirt expands against the barrel rifling grooves. 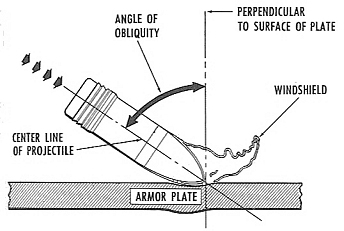 The triangular end profile is most common in Civil War bullets with three barrel rifling grooves but the square or four rifling groove end profile is usually found in foreign weapons. 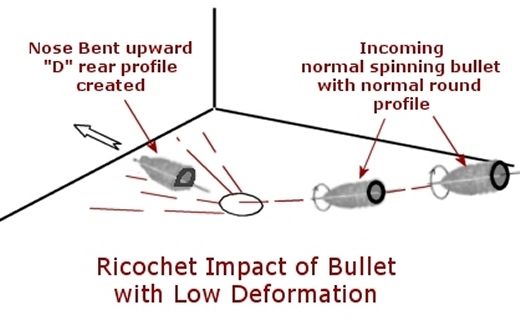 The end profile on the ricochet bullet is in the form of a “D”. 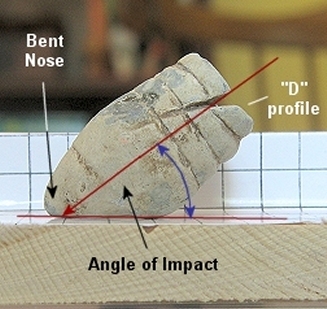 The flattened portion of the profile (see photo below) is created as the bullet strikes the ground and leaves the impact area. This final modification to the end profile might be superimposed over the triangular or square profile created as the bullet leaves the barrel. Flat part of the "D" in the picture above is slightly tilted to right. In theory, After a richocheting bullet hits the ground it slides or yaws to the right or left depending on a number of factors. First, the amount of spin and spin direction imparted to the bullet from the barrel. Second, the plan of orientation of the impact area with respect to the trajectory of the bullet and lastly, the amount of energy remaining in the bullet after impact. When the bullet hits the ground, it sheds considerable energy into the ground. Shots will lose spin and may tumble end over end if they encounter something hard or still have energy after impact. All of this affects the amount of nose and skirt deformation of the bullet. 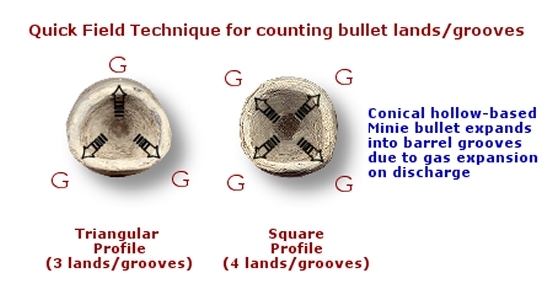 In many cases, the bullet lands non-destructively because most of the forward energy of the bullet has been taken by the soft ground and tumbling is kept to a minimum. Looking at my finds over the last few years, I found number of bullets with the “D” profile whose noses were barely deformed and I must assume that these slight deformations came from very low angle of incidence with the ground. 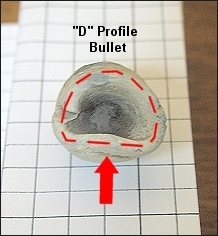 The photo below shows the “D” profile of a ricocheted bullet. The red arrow at the top of the screen shows the approximate position of the nose of the bullet. Notice the other red arrow is drawn along the base of profile and is perpendicular to the nose direction but is offset to the right slightly. The right is the yaw direction. 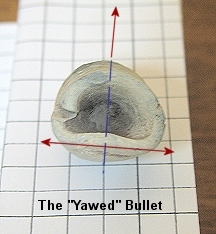 The angle of impact with the ground can be approximated on the same bullet by looking at its side view. The red arrow is made down the center line of the bullet. Notice the bottom of the bullet has been deformed as the “D” profile is formed. Also notice that the nose is bent away from the center line. The angle of impact can be measured between the flat side of the “D” and the centerline. What can be done with angle of impact measurements of bullets from the relic field of a rifle practice area or discharge area? Maybe it could tell us something about the topography of the hill or field that the bullets were shot into. At 150 yards, the typical rifled musket bullet would have probably impacted horizontal ground at less than 5 degrees if shot horizontally. If there was a 2 degree slope to the ground at this distance the angle of impact would be about 3 degrees. The above angle of impact measured about 38 degrees. This means that either the bullet was shot into the ground at this high angle (discharge area) or there was a significant slope that it was fired against (high angle practice area) or there was a significant amount of bullet deformation on impact (hit hard ground?). At a very minimum, ricocheted bullets were a target “miss” in a practice area or else we would see more deformation. 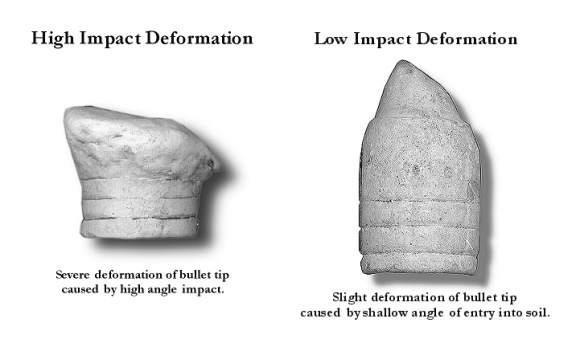 Civil War bullets commonly fall between two extremes of deformation: High Impact and Low Impact. Ricocheted bullets are obviously the latter. Bullets that hit a hard target deform to High Impact. Fellow relic hunter Pete George once imparted this sage advice to me about hunting around battlelines and more commonly behind fortifications. “Always look for the high impact bullets because they hit something and relics are always around “hits”. Low impact bullets were near misses and fewer relics are found around these areas.” The “hits’ he referred to were either the fortifications hits or people hits and in either case relics are to be found. What can the relic hunter take away from this discourse? First, the shape of shot bullets can tell us much about what was going on near campsites. Practice areas and discharge areas will contain abundant ricochet bullets if ground is soft and not too rocky and is at a low angle with respect to the shooter. In a target practice areas, high impact deformation bullets should be near the target and ricochets and low impacts should be farther away from the target. The relic trail from low impact deformation to high deformation bullets should point back to the shooter’s position. and the shooter’s position can be determined if dropped bullets and percussion caps can be located. All it takes is careful observation and recording when relic hunting. Theoretical relic field distribution of Low Impact and ricochet bullets (LO) and High Impact deformation bullets (HI) around target practice areas on low sloping hillside near Civil War campsite. Ground must be soft. Finally, it shows how careful observation and a little computer research let my whacked-out mind relate modern blood-splatter technology to Civil War history. NOTE: Much of this article was originally published in American Digger Magazine.